Regular roof maintenance will maximize the investment that you have in your roof system. There are numerous studies that show a modest amount of money spent every year for preventative maintenance, cleaning drains and gutters, and general upkeep will push back the major expense of a reroof. Any roof maintenance program should start with a file of your roofing records. This file should include basic roof information, a roof plan, information on the type of materials that are installed, a copy of your warranty, and copies of all inspections and service calls for the roof. To learn more about the benefits and cost savings of roof maintenance call your local branch of Service Works, Your Full Service Roofing Contractor. For too many Facilities Managers, Property Managers, and Owners, roofs are a prime example of "out of sight, out of mind." But maintenance is vitally important if you want to keep the rest of your building in good shape. Don't make emergency spending for roof repairs a habit. Use your budget wisely and perform inspections and preventive repairs to avoid big expenditures. Get a handle on roof maintenance with this guide to keeping your roof in good health. 1. More time between replacements. The biggest reason to maintain your roof is that it extends the roof's life, which offers multiple advantages. Roof technologies have improved considerably over the last few decades, so it's not unreasonable to expect a lifetime of at least 20 years from a properly installed and maintained roof. Without maintenance, the expected lifetime is more like 10-15 years - and if you're planning to occupy your building longer than that, the cost of re-covering or replacing your roof 5-10 years early will add up quickly. 2. Avoid structural damage. Roof leaks lead to rusted steel or rotting wood that can compromise your facility's structural integrity, requiring a costly fix. been maintaining your roof and have provided annual inspections you may have some water intrusion. How do you determine just how much of the roof may have wet substrate? A thermal scan will show areas that are holding moisture. A scan is done at dusk and the wet areas retain the days heat longer than the surrounding roof, so these ares show up as a different color. The color image above is from an actual scan. 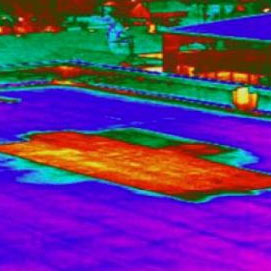 For a thermal scan of your roof consult the professionals at Service Works.